PBS is home to Julia Child. Since her first cooking program aired on public television in 1963, she has inspired millions of amateur cooks and many professional chefs with her well-honed skills, easy kitchen spirit, and passion for learning. She began with a sincere passion for good food and the pleasures of cooking, studying in France in the '50s with chef/friend Simone Beck. With the help of Louisette Bertolle, another dedicated food lover, they created a cooking school called L'Ecole des Trois Gourmandes and later, in 1961, completed their groundbreaking cookbook, Mastering the Art of French Cooking. Her book and the popular television show that followed made the mysteries of fancy French cuisine approachable, introducing gourmet ingredients, demonstrating culinary techniques, and most importantly, encouraging everyday "home chefs" to practice cooking as art, not to dread it as a chore. 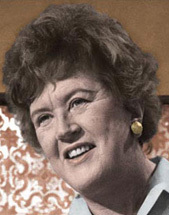 Host of numerous shows, including Cooking With Master Chefs, Baking With Julia, In Julia's Kitchen With Master Chefs, and Cooking in Concert, toques off to Julia Child without whom American cuisine might still mean gray beef and mushy boiled onions. Julia Child passed away on August 12, 2004. "Julia Child's legacy to America is felt nowhere more strongly than at PBS," said Pat Mitchell, former President and CEO of PBS. "When it all began on WGBH, Boston's public television station, in 1962, no one had ever done a cooking show on television. But Julia set a standard for far more than a genre that has grown exponentially ever since. She made sophisticated cooking techniques accessible while promoting the art of cooking to men and women alike. She was a funny, witty and debonair character who charmed all who knew her - even if just by her television appearances. We're honored to have had her as part of the PBS family and we will cherish her memory."